Federal and state government affairs activities are now fully underway, and the ATPC is engaged. The 2016 elections brought a change in leadership and priorities at the federal level, and ATPC Executive Director H. West Richards recently took his first 2017 trip to Washington, D.C., attending meetings scheduled by the federal government relations team at Whitmer & Worrall. West and team attended the constituent breakfast – “Donuts with David” – for Georgia’s junior Senator, David Perdue. West had some time to meet with the senator and his staff, in addition to enjoying some pastry! 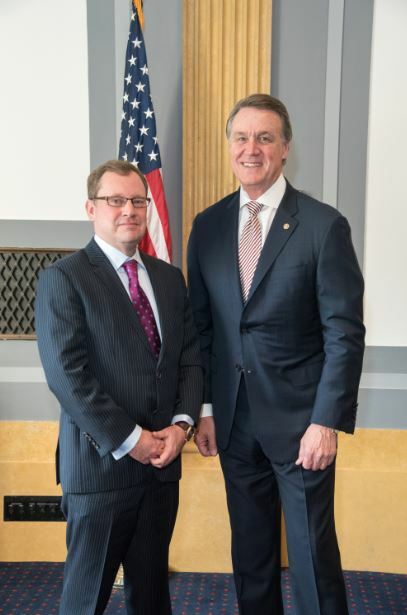 West took this opportunity to congratulate Senator Perdue on his new appointment to the U.S. Senate Committee on Banking, Housing and Urban Affairs. Meetings also took place with staff from Rep. Barry Loudermilk’s office (R-GA, 11) to discuss how the ATPC can be a resource for the congressman’s new appointment to both the House Financial Services Committee and Congressional Fintech and Payments Caucus (CFTPC) following Rep. Lynn Westmoreland’s retirement and vacating of his co-chair position. The ATPC also held their first meeting with the office of new Payments Caucus co-chair Rep. Randy Hultgren (R-IL, 14) along with a follow-up meeting with Rep. David Scott’s (D-GA, 13) staff to discuss the payments caucus. The Congressional FinTech and Payments Caucus announced that strong ATPC supporter Congressman Patrick McHenry (NC-10) has been added as a new co-chair to the caucus. Congressman McHenry and Congressman Randy Hultgren (IL-14) will join Congresswoman Kyrsten Sinema (AZ-09) and Congressman David Scott (GA-13) as caucus co-chairs for the 115th Congress. The ATPC continues to monitor and interact with Congressional offices on a range of legislative activities, including a prepaid resolution that falls under the Congressional Review Act (CRA) that has the support of both Georgia Senators Isakson and Perdue, and Rep. Tom Graves (R-GA, 9). The ATPC continues to monitor legislation impacting the Consumer Financial Protection Bureau (CFPB) making the rounds, possibly providing an opportunity for ATPC members to testify on behalf of the industry to the House Financial Services Committee, led by Chairman Jed Hensarling (R-TX, 5). At the state level, the J.L. Morgan & Co. team is on site daily under the Gold Dome, attending meetings, briefings, and hearings where they gain insight into bills possibly affecting the industry. H.B. 66, which seeks to tack on transmittal fees for wire transfers, caught the attention of many Georgia companies, especially ATPC members. The ATPC government relations team alerted members to this legislation, sought their review and feedback, and has been working with legislators to address concerns in the bill. The bill met fierce resistance from the payments industry, banks and credit unions, and while after a great deal of lobbying have diminished its prospects of success, it still remains a potential issue requiring further efforts by the ATPC team and others. The ATPC continues to work with the University System of Georgia Board of Regents on the development of a FinTech curriculum. And plans are being made for ATPC member companies to address the Senate Banking Committee. More updates will be communicated in the monthly “Special Report” emails, and a recap of the 2017 state legislative session will be included in the Q2 newsletter following Sine Die.